EURUSD – Bottom in Place? The EUR/USD which made a near 300 pip round trip in post Italian referendum trade yesterday, first dropping to a low 1.0504 and the spiking to 1.0798, was much calmer today but remained near the two day highs and within striking distance of the 1.0800 figure. yesterday’s price action suggests that the pair may have made a near term bottom and could continue to squeeze higher even possibly towards the 1.1000 figure especially if ECB President Mario Draghi offers no definitive calendar extensions to the QE program. Ultimately the euro may be headed to parity as the policy divergence between the Fed and the ECB begins to kick in. But for now the market is still looking for the Fed to affirm its intention to tighten continuously in 2017 rather than the one-and-done December hike that is already priced into the market. Meanwhile, if the ECB simply sticks to its current QE targets and doesn’t extend or expand the program, the short squeeze in the EURUSD could continue as expectations are adjusted on both sides of the trade. For now the 1.0500-1.0550 level is a firm bottom while 1.0900 is the nearest term top for the pair. 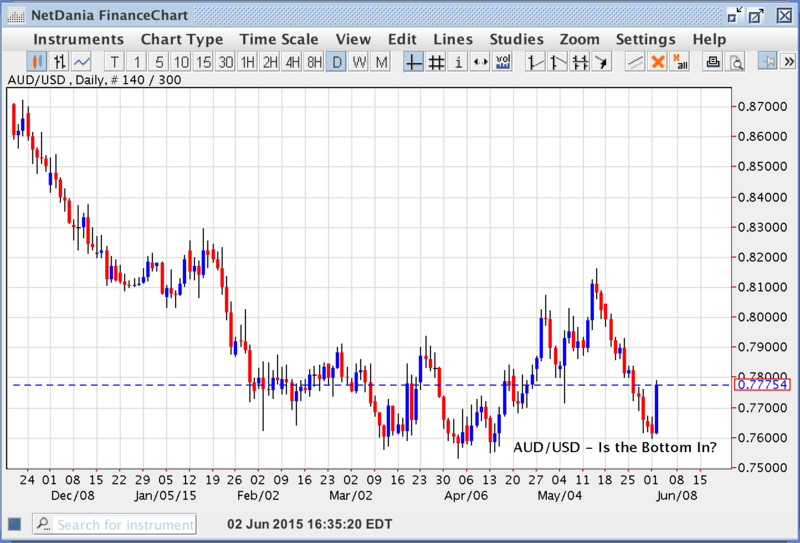 AUDUSD – A Top in Place? Meanwhile the pair has made clear triple top at the .7750 level and now becomes a sell the rally trade as it likely travels to the lower part of the range at the .7450 level over the next several weeks. 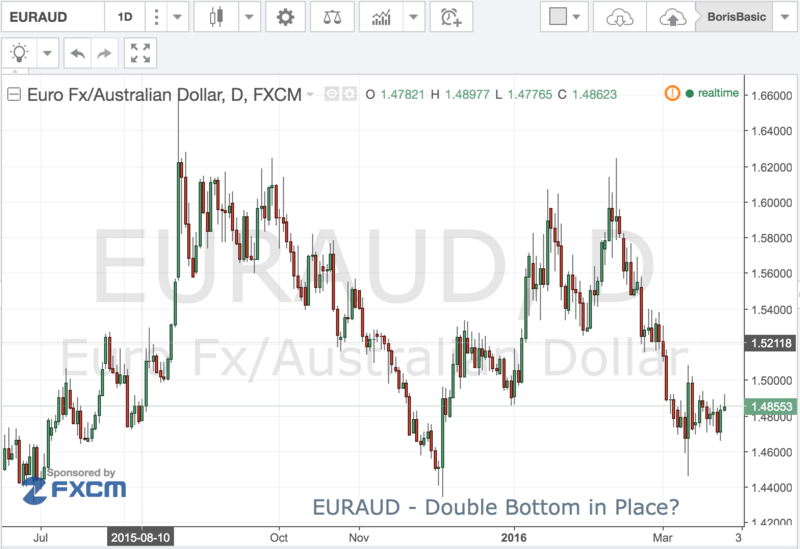 EURAUD – Double Bottom in Place? For the past few weeks the commodity rally helped to fuel a one way move in Aussie that has taken even the staunchest bulls by surprise. But with oil, gold and iron ore prices starting to peter out the Aussie rally may be finally running out of gas. As the assent of the pair has slowed it’s gains against other majors have slowed as well. 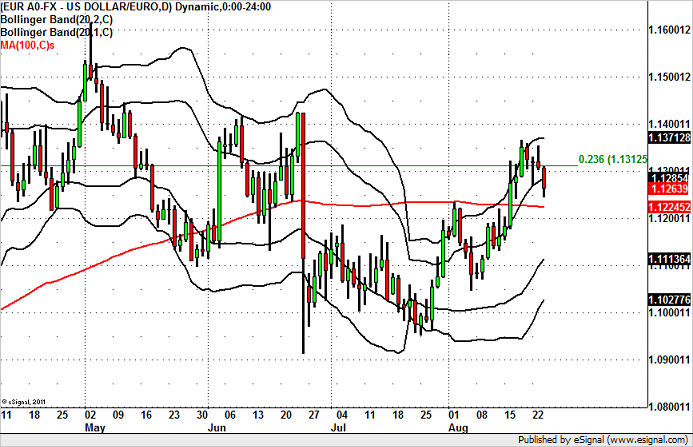 A good case in point is EUR/AUD which looks like its starting to put in a double bottom at the key 1.4500 level. Although there is little on the horizon to propel euro higher, the gains in the cross could come just from the correction on the Aussie itself. The holiday calendar is barren next week, but if the macro factors continue to dominate trade and unwind some of the recent gains of the past few weeks, EUR/AUD could be well on its way to 1.5000 before the month’s end. 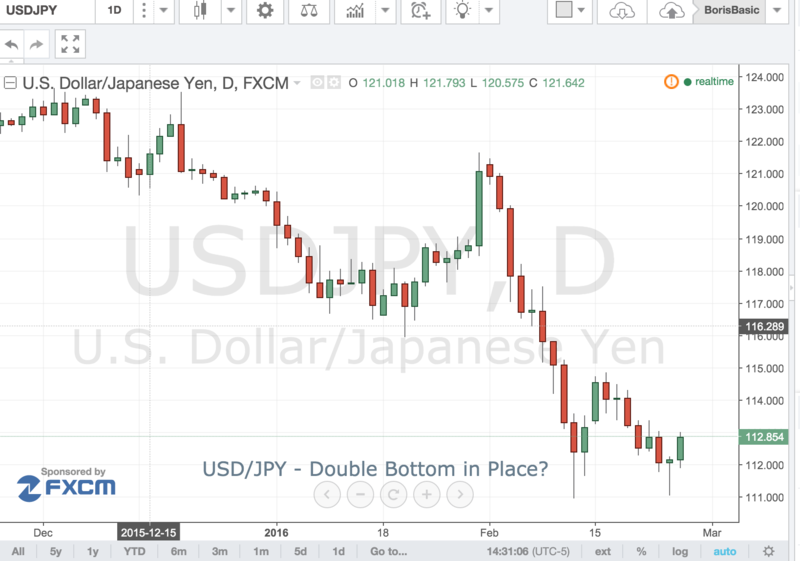 USD/JPY – Double Bottom in Place? USD/JPY has staged a furious rally off yesterday’s lows popping nearly 200 points as it broke the 113.00 barrier in late NY session trade. The return of risk on has helped the pair move higher as it appears to have successfully tested the recent lows and put in a double bottom. GBP/CAD – Where’s Good Place to Sell? 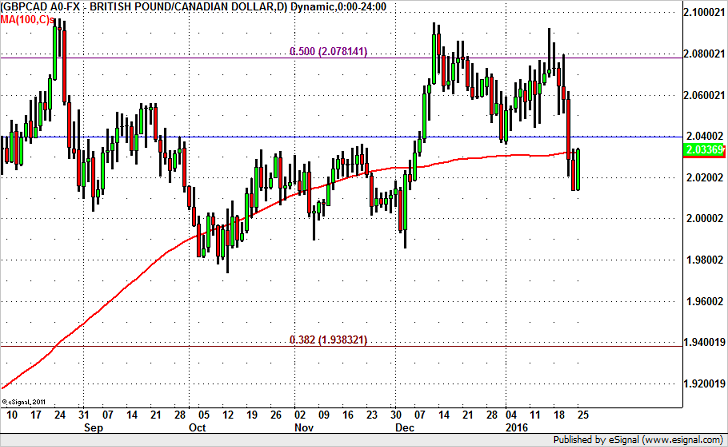 Fundamentally, we believe that the recent decline in GBP/CAD marks a top for the pair. Sterling faces a host of problems in the short and medium term while CAD, which has been hit hard by lower oil prices is nearing a bottom. This morning we learned from the Confederation of British Industry in the U.K. that manufacturing orders fell sharply in the month of January. While this is not a widely followed release, it shouldn’t be ignored as it has a strong correlation with the broader PMI manufacturing report. Export orders fell at a sharp pace in January, which does not bode well for U.K. growth. GDP is the only piece of market moving U.K. data on this week’s calendar and recent reports such as retail sales and trade point to a slowdown in growth. At the same time, last week’s Canadian economic reports were good with retail sales in Canada rising 1.7%. Oil is obviously a problem but $25 should mark a bottom for crude. So that leaves the question of where is a good place to sell GBP/CAD and that’s where technicals come into play. The currency pair is attempting to break above the 100-day SMA and while that is important, the main resistance is level is 2.04. So the first opportunity to sell would be near 2.04 with a stop above 2.06. The more conservative option would be to sell closer to 2.06 with a stop above 2.08 for a move back to 2.000. *This is NOT an official Big Trade recommendation but rather an interesting opportunity to watch. Cable has been a clear winner over the past few days as the much better than expected wage data and decent Retail Sales have revived talk of a possible BOE hike this year. After today’s dovish FOMC presser that is much less likely -- the BOE is not going to front run the Fed when it comes to normalizing policy, but it nevertheless provides a bid for cable as the unit remains the only viable G-7 currency that could actually tighten policy in the foreseeable future. In the meantime the kiwi continues to languish and even today’s big anti-dollar rally was quickly extinguished on the back of concerns from chairwoman Yellen that China’s slowdown is a problem. The RBNZ remains resolutely dovish and that means that rates on kiwi could go lower before the year end all of which keeps the GBP/NZD uptrend in place. 2.4000 remains the key support while 2.5000 is the next upside target for the bulls. 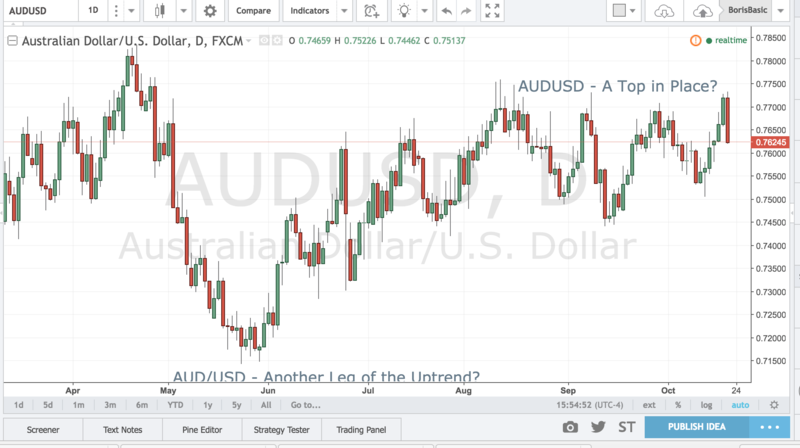 AUD/USD – Bottom in Place? One of the bigger beneficiaries of today’s anti-dollar rally was the Aussie which soared nearly 200 points on the day. The pair was helped by the more or less neutral RBA which held rates steady for fear of fueling an even bigger housing bubble. As we noted earlier today, although the economy remains sluggish, policy makers are loathe to cut rates further now for fear of stoking a housing bubble and are likely looking for macro prudential rules to take effect before easing monetary policy anymore. The focus will now turn to tonight’s GDP data to see just how weak the AU economy really is. If the data is actually better than anticipated the Aussie could push through .7800 as the night proceeds. Technically the pair has very sound support at the 7600 level but faces resistance at 8000-8100 corridor providing it with ample room to run just yet. 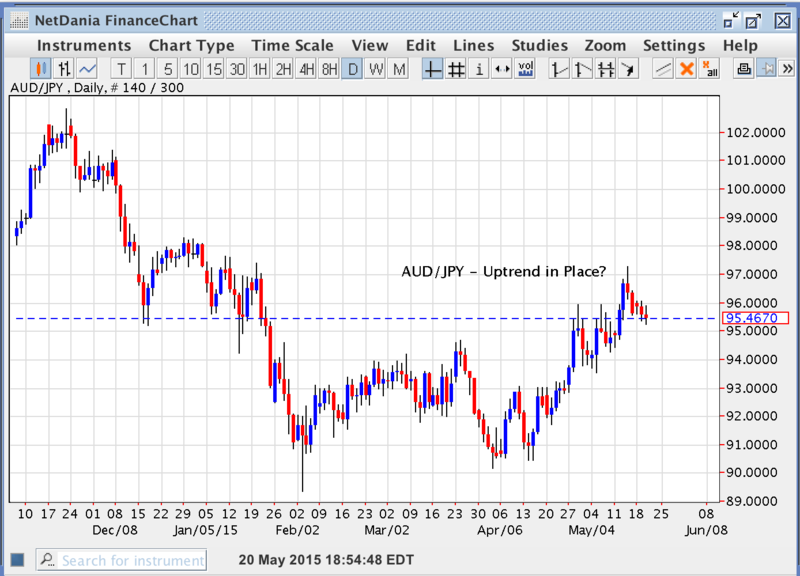 AUD/JPY – Uptrend in Place? After staging a strong 700 point rally AUD/JPY has stalled at the 9700 level, but the uptrend may still be in place. While the yen component is clearly dependent on the musings of the FOMC it is becoming increasingly clear that it is simply a question of when not if the Fed will hike rates. Today’s minutes confirm that most policymakers are ready to normalize rates and are just waiting for further signals from the US economy. The true upside in the pair however, is likely to come from the Aussie side and that is very contingent on Chinese data. That’s why today HSBC PMI report could be key to the near tern direction of the pair. If the data shows that demand in China has stabilized and even began to improve, AUD/JPY is likely to resume its uptrend. If however it shows further contraction the pair could break trendline support and the 9700 figure would mark an swing top for the time being. **Given the sharp fall in dairy prices and upcoming FOMC. We are canceling these orders for now. 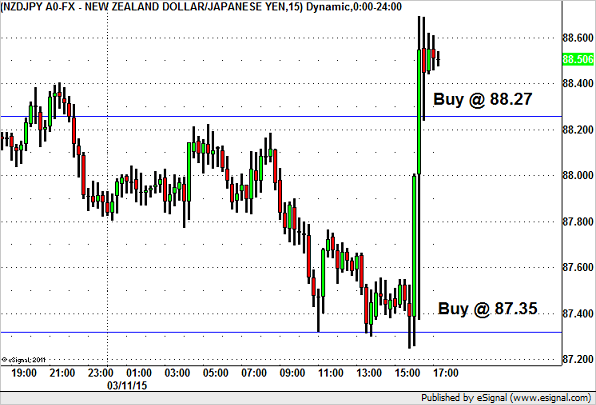 We like the New Zealand dollar and we like USD/JPY and this combination makes NZD/JPY an extremely attractive trade. This afternoon the Reserve Bank of New Zealand left interest rates unchanged and told us that they see a prolonged period of interest rate stability. While this is far from the hawkish view that is typically needed to lift a currency, in an environment when investors are worried about who will cut rates next, their steady outlook proved to be extremely positive for NZD. 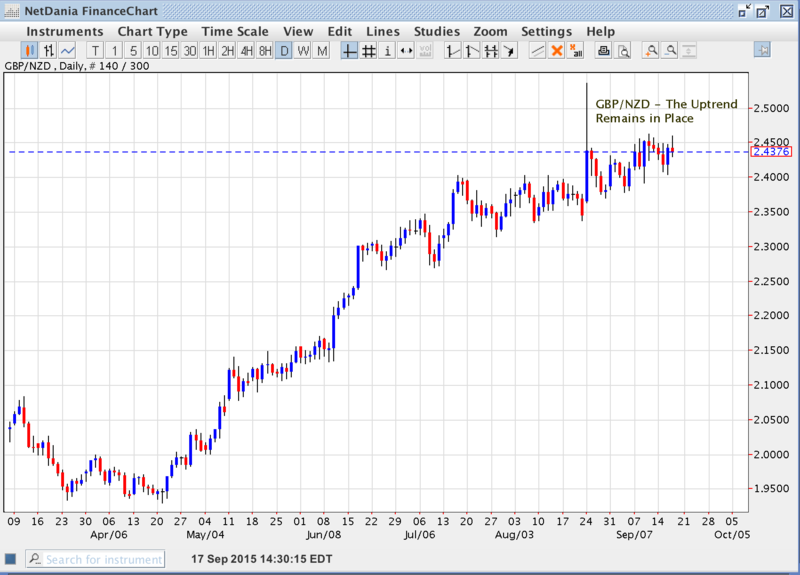 In fact NZD/USD erased all of its earlier losses to end the day in positive territory. RBNZ Governor Wheeler’s belief that inflation will pick up when oil effect passes and that New Zealand is in a different situation than many other countries suggests that they have no intention of moving rates even though they warned that the next move in rates could be up or down -- this guidance should lead to a further recovery in the New Zealand dollar. Meanwhile we continue to look for a stronger U.S. dollar ahead of next week’s FOMC rate decision. Tomorrow’s consumer spending numbers will most likely reinforce the attractiveness of the greenback as strong non-farm payrolls, rise in gas prices and increase in spending according to Redbook point to a stronger report. The Federal Reserve is gearing up to raise interest rates and regardless of whether it comes in June or September this prospect should continue to be extremely positive for the US dollar. While Fed tightening in 2015 is widely expected a change in forward guidance next week will still lift the dollar and this event risk acts as a target for dollar bulls buying into the news. If retail sales surprised to the upside like we expect, it will harden expectations for a shift in guidance that should send the greenback to fresh multi-year highs against many major currencies going into next week’s monetary policy announcement. BK USD/JPY Big Trade Update, Move Stop to 118.70 to lock in +80 pips. Will reload lower if we get stopped out. It is time to Buy USD/JPY. Negative interest rates in Switzerland and Quantitative Easing by the European Central Bank leaves the market looking for alternative safe havens. The Yen is attractive but from a fundamental perspective not nearly as alluring as the dollar because U.S. economy is actually improving while Japanese growth is struggling. The Fed is one of a select few central banks looking to raise interest rates this year with the chorus growing. Regardless of whether they choose to do so in the summer or fall doesn’t matter -- the key is that they plan to do so period and that along with the loss of the Franc as a safe haven should make the dollar more attractive. In the long run, we are still looking for USD/JPY to revisit its 121.85 December high.